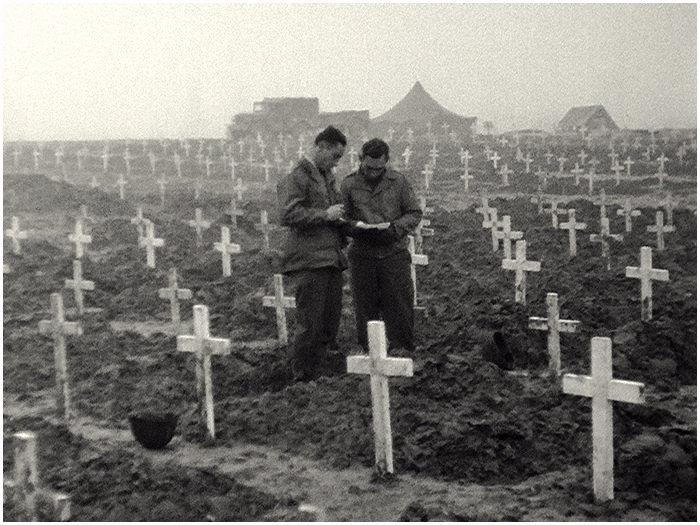 Below you find the sad story on the construction of the American cemetery of Margraten. The men and women who helped to bury the American boy's here, are the, often forgotten, true heroes. Still, in this century, they are called to perform their duty far from home,… Will there ever come a time when the last wargrave is dug? During 1994 an article was written by Jan Hendriks and Hans Koenen called 'D-Day in Zuid-Limburg. De bevrijding van uur tot uur, van plaats tot plaats'('D-Day in South-Limburgh. The liberation hour by hour, from area to area') published by the local paper 'De Limburger'. Thanks to Ton van Geldrop I got hold of a copy with the section on Margraten. It's a timeless piece and I use it here as a great lead to show you the horrors of Margraten. 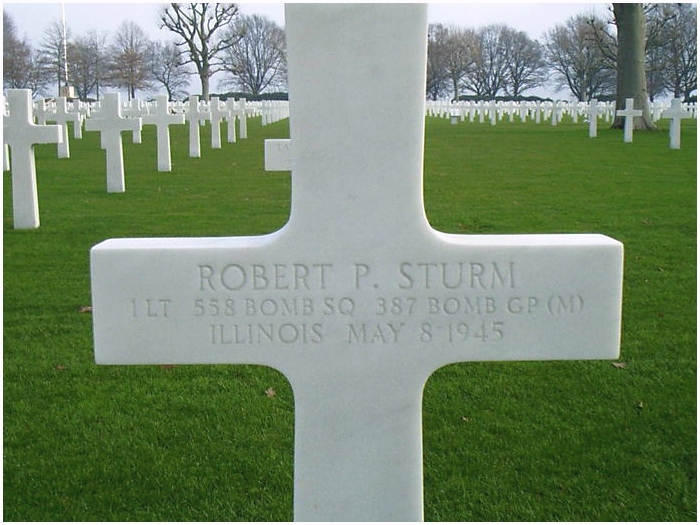 The first American cemetery on Dutch soil was planned near Sittard. During the battle for Aachen, Captain Joseph Shomon of the 611th Graves Registration Company scouted a field east of Sittard in Oktober, 1944. 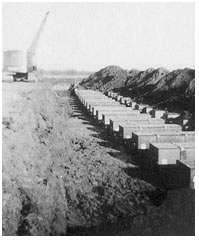 Some bulldozers were put to work to flatten the surface and create the roads leading to the planned cemetery. Germans, who thought that American tanks were assembling, heard the tracks of the bulldozers. They opened up with their artillery. Shells were falling everywhere; even American artillery became a target for the German 8.8cm guns. The 9th Army gave order to the 611th Graves Registration Company to move their business elsewhere. Together with Lt. Doyle Jensen, Captain Shomon started a new search that brought him to the townhall of Margraten, because there was someone, Jeff van Laar, who could speak some English. They went to some locations, till their eye hit on a field between Margraten and Cadier en Keer. The American were already familiar with this terrain, they had used it temporarily as a small field for reconnaissance planes. Van Laar told Shomon that this was the best ground for growing crops in the whole region. But Shomon already had made up his mind and answered to Laar; 'The best soil is not good enough for our boys,…' The farmers got 75 Dutch cents a yard for compensation (a small token, but who dared to complain when it was for their liberators?). Margraten became a small armycamp with 250 men and officers of the 3136th Quartermaster Service Company. This company was made out of mostly Afro-American soldiers, which stood under command of Captain Abar. As soon the digging started, the weather turned for the worst. Heavy rain seems falling day in day out. The graves, 5 feet deep, 2 feet wide and 7 feet long, filled up with water. Soaking clay was sticking everywhere, the shovel, shoes and clothing. The first trucks with body's arrived in Margraten in November, 1944. The bodies were placed on a so-called 'strippingline'. Personal items were removed, just as ammunition and grenades. Some of the body's were already decomposing, others were no more than pieces of meat on bones. It was a grim task for the identification team. The first day on the job for new members on the team was horrible,… retching and vomiting up was a common sight. The saved personal belongings, like letters, watches, money and pictures were send to the family. Some victims had already one piece of the 'dogtag' in their mouth, placed by a comrade or a medic. In other cases the identification team of Margraten did this. Was the face and deformed by wounds, then the 'tag' was placed in de hands of the deceased. The second 'dogtag' was hammered to the wooden cross. The rain and fog could not drive away the terrible stench of the dead. But the men who first were sick of the sight, were eating in no time their lunch among the rotting body's. 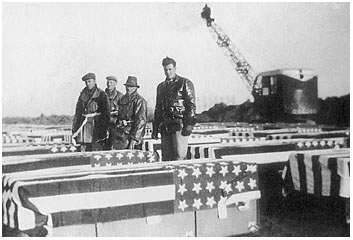 On November 10, 1944 the first American was put to rest at Margraten. It was the first of many deliveries that close the day. During a daily ceremony, a priest recited a prayer, the 'Last post' was blown and the flag was lowered. Salute shots cracked over the silent field to underline the sacrifice brought by America's best and their lost future. It was a daily ritual on Margraten for months. The dead arrived daily, and not only American. Other Allied soldiers were brought to Margraten and even Germans were delivered. Army trucks drove with their gruesome cargo out of Germany, and during the offensive in the Ardennes, to Limburg. Often the drivers pulled up at the mess in Margraten, before they headed for the cemetery. 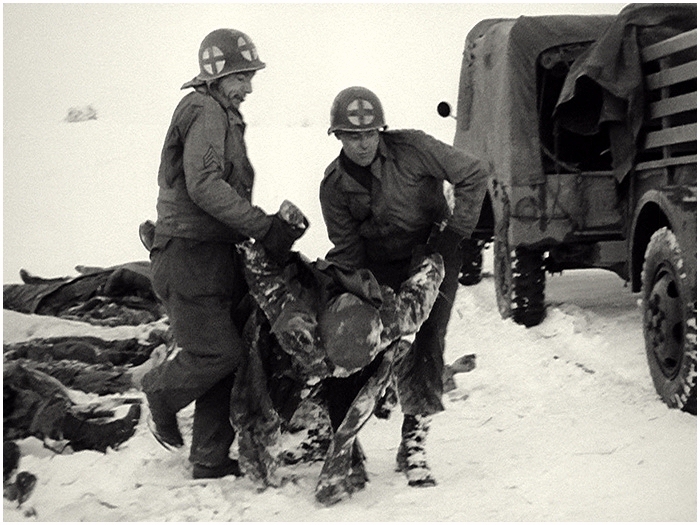 After a while, when they drove of, a track of blood run through the streets of Margraten from their leaking vehicles. It was hell on earth at Margraten. The wet slush and mire made working on this field almost impossible. Vehicles got stuck in the mud. They brought in gravel to strengthen the road, but the ground soaked up the gravel, just as the rocky stones they tried after that. The best solution was trunks from trees covered with rubble from the town of Aachen. Winter that year was early and extreme hard. The soaking soil was a willing victim to the frost. In no time the mire became concrete. The death toll shot sky high when the Germans tried to break out trough the Ardennes on December 16th, 1944. 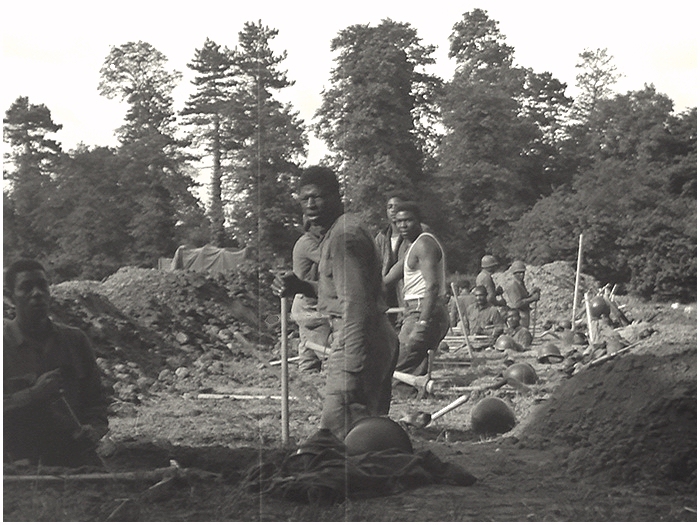 The pressure on the men working on the grave at Margraten was put to the test. The ground was frozen solid and they had to use blowtorches and axes to dig a grave. New arrivals for the dig teams were not prepared for the cutting cold weather. Boots and shoes with lining were taken from the dead. Under the rattling canvas of the tents, frozen bodies were identified. Sometimes when they had to make a fingerprint, they had to chop of the finger the reach it. Beneath the shrunken skin, a fluid was squirted so a fingerprint could be made. 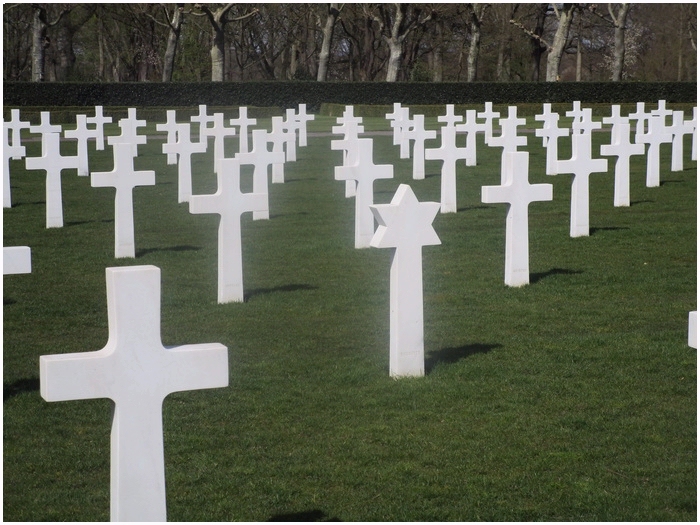 The American cemetery at Henri Chapelle in Belgium was at her limit with 17.000 graves and closed. It gave al the more pressure at Margraten. Two days after the 9th Army the Rhine crossed, a 1000 bodies arrived at Margraten. Captain Shomon asked the mayor Ronckers of Margraten to mobilise the people of the place to give a hand at the cemetery. The reply was more than positive, within two days al the of the 1000 dead were buried and enough graves were ready to lighten the pressure on the Service Company. At the end of May 1945, at Margraten the numberd buried was almost 17.000 and reached her capacity. 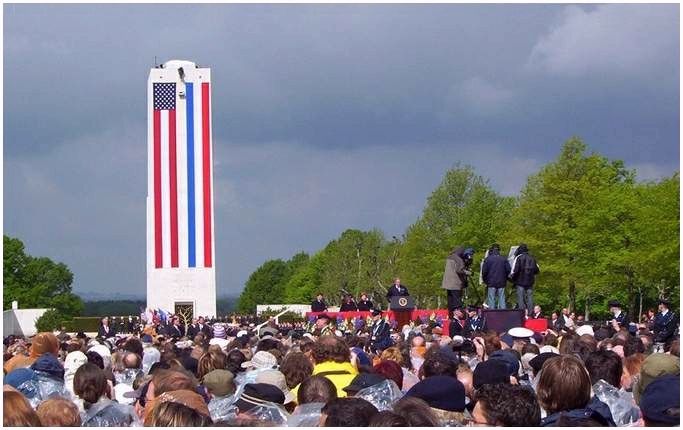 May 30, the first Memorial-Day remembrance, was held at Margraten. The complete cemetery was covered in flowers, deliverd by 20 trucks that had collected them in 60 villages in Limburg. The 1st of June was the day that the soldiers of the Service Company left their workinground of nine months. Months of very heavy, gruesome labor were behind them, but it was a labor of gratitude and one to be proud of. At the end of the 1940's the dead were exhumed and cleaned to the bone. The last remains were cremated. The cleaned skeletons were warped in sheets and blankets before they were put into steel coffins. The inside of these coffins were bronzed and lined with silk and the lid was welded to the coffin. As mentioned before, there were also buried a large number of Germans. These were re-buried after the war at the German cemetery at IJsselstein. 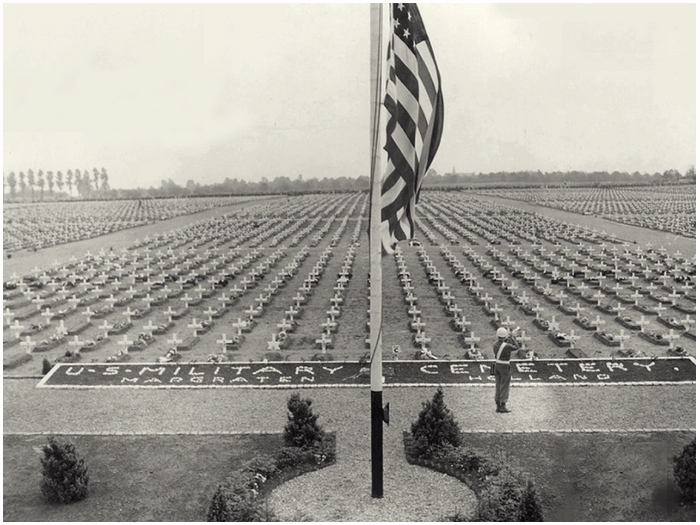 In the fifties of the last century, some 11.000 American coffins were exhumed and shipped to the States, it was in this period that the American Cemetery Margraten her present-day shape became. Joseph J. Shomon ended the war as a Lt.-Colonel. He wrote a book called Crosses in the Wind. Shomon was offered the freedom of the city of Margraten in 1960 and a street bears his name. He received many medals and charters, among them the Meritorious Service Award. After his death, 18 September 2003 (88), his body was buried on October 31st at Arlington National Cemetery, Washington, DC. President George W. Bush at Margraten, May 8th, 2005. The first president to visit Margraten was President Bush on the 8th of May, 2005. Many speakers that day remembered the killed soldiers and their fight for our freedom, rightly so,… bud sadly no one remembered the hard laborers of the first hour here at Margraten, the Afro-American, who did their horrific work for eternity. May 8, 1945, 70 years at Margraten (2005). At the American Cemetery te Colleville-sur-Mer, Normandy are three bearers of the Medal of Honor. At Margraten are six. Under these six is one Afro-American, Willy F. James Jr. He was awarded in 1994 the Medal of Honor for gallantry. How he won it, can be read on the next page. 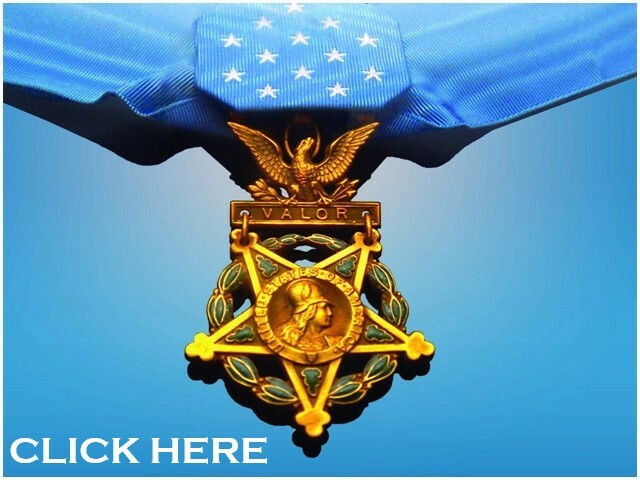 Click for the next page on the Medal of Honor below.